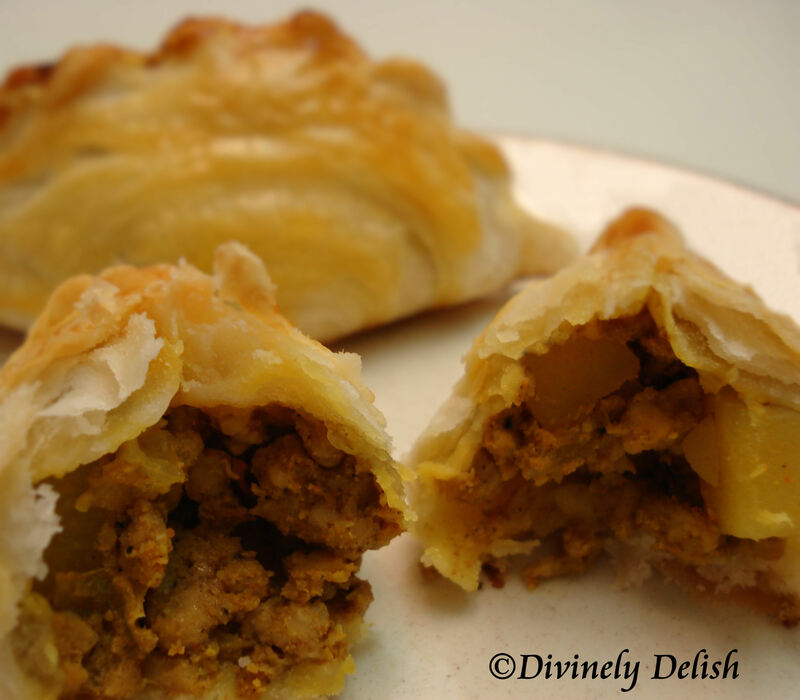 Curry Puffs (or Karipap in Malay) are a popular snack in Malaysia and Singapore. Traditionally deep fried, they are pastries filled with a curry mixture of usually either chicken and potatoes or beef and potatoes. Indeed, many countries have their versions of filled savoury pastries. Just as I’m fond of empanadas and samosas, I love curry puffs. For a snack, I’ll choose curry puffs over cupcakes or cookies anytime! Since I make a lot of desserts, people are usually surprised to learn that I don’t actually have a sweet tooth! I’ve adapted this recipe from various sources. I also decided to bake them instead deep frying, just as a personal preference (It means I can also eat more of them without feeling too guilty!). Deep frying does separate the layers of dough and brings out the “spiral” pattern in the pastry, which is not as evident with the baked puffs. Still, these are light and flaky and they taste wonderful! 1) Heat oil and fry onions until golden brown. 2) Add the ginger, curry, chili and turmeric powders and continue frying. 3) Add chicken, potatoes, sugar, salt and pepper. Mix well and cook for 10 minutes or until the chicken is done and the potato is tender. If too dry, add a little water and cook until the water is absorbed. 4) Leave aside to cool. 1) To make WATER DOUGH, place flour in a mixing bowl. Rub in shortening/butter and add in the water. Knead into a smooth dough and leave aside to rest for 10 minutes. 2) To make OIL DOUGH, rub shortening/butter into the flour. Combine and knead to form an oily dough. 3) Divide both the water dough and oil dough into 12 equal portions each and roll into balls. Keep the oil dough portions in the fridge to prevent them from getting too soft. 4) Flatten one ball of WATER DOUGH. Place one ball of OIL DOUGH inside WATER DOUGH, wrap and pinch to seal. 5) Using a rolling pin, roll out the dough lengthwise (about 6″ long). Using your hands, roll up the dough like a Swiss roll. 6) Turn the roll 90 degrees, and repeat Step 5 again. 7) Cut each roll in half, place the cut side down and flatten slightly with the palm of your hand. 8) Roll the dough out into a thin circular shape (about 4″ in diameter), ready to be filled. 1) Preheat oven to 420F. 2) Place 1 heaping teaspoon of filling into centre of pastry circle. Fold pastry over into a half circle, seal and crimp the edges. 3) Place on a baking sheet, brush with egg wash and bake for 15 minutes or until golden brown.